West Pymble have won the Premier League championship. They managed to do it with well before the end of the season with a nine game winning streak. The only club to come close to troubling West Pymble has been North Sydney and one week before the close of the season West Pymble are six points clear and a game in hand. West Pymble have achieved something quite rare this season, the double-double. 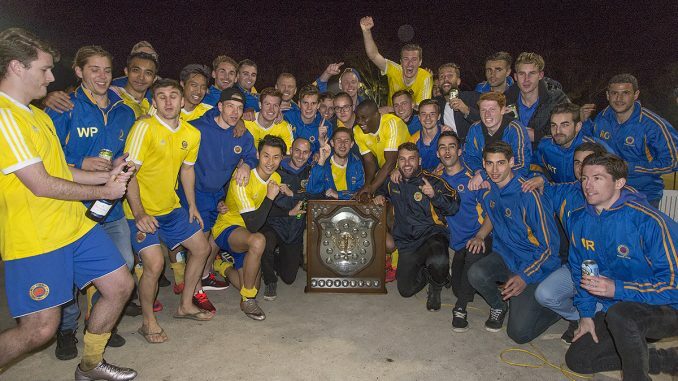 That is, the first grade Premier League side has won the championship twice in a row and both the first grade and the reserves have won the league. This is a key point for their success said Club President Kevin Johnson, with focus being given by this highly successful club in to developing a strong reserve grade. 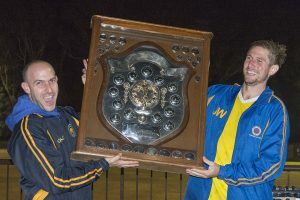 On Saturday evening the celebrations began after their match with Knox United, when captain Jamie Wall and coach Greg Fuchs were presented with the trophy NSFA Premier League Trophy. Officiated by four of the NSFA board members (Hillary Bingham, Ian Plant, Mick Da Silva and Johnathan Forsyth) and club president Kevin Johnson acting as Master of Ceremonies for the proceedings. West Pymble’s win this season is their tenth win in the Men’s top division making them the most successful club in the history of the competition (3 ahead of Kissing Point). It was also their 6th win in Reserve grade and first since 1995 which is testament to the great work of their new reserve’s coach Chris Seeman. However, it wasn’t all sunshine and roses for West Pymble on Saturday afternoon. 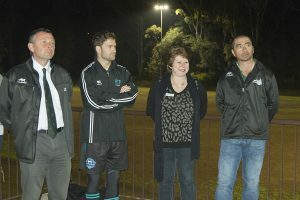 Suffering their first loss in ten matches to Knox United might have tainted the evening very slightly for West Pymble but it cemented Knox’s place in the Premier League for another season. The match was as dramatic as any I have seen this year, with West Pymble conceding a penalty early in the first half and Knox having their goalie red-carded! The red card fired-up Knox who went on to win the day 3:1. It goes to show just how much a ten manned squad can achieve when the result is really important. The three points to Knox moves them to 21 points and which means Berowra and Northbridge will be relegated at the end of the season. Next season will see Willoughby Dalleys move back up to the Premier League and they will be joined by Mt Colah again. But the season belongs to West Pymble. This is their 47th continuous year in the top flight competition. Ten premier league wins, six reserve grade wins and a great bunch of lads to watch on a Saturday afternoon. Now all they need is decent surface for their home games.